Dyna-Ski Boats: Outboards, back in? Katharine McPhail of www.travelboater.com wrote the following article a couple years ago. She wrote it for WaterSki Magazine but they never published the article. Are you a serious skier who can’t stomach the price of an expensive inboard boat, consider the alternative: a tournament style outboard. 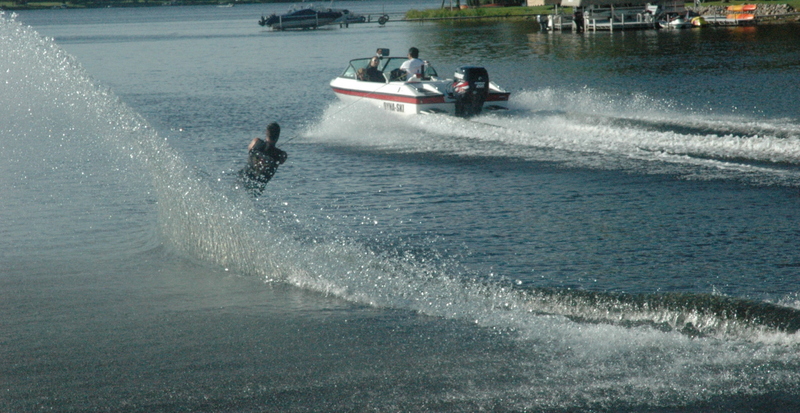 For less than half the price, an outboard ski boat can offer some pretty sweet advantages. Dyna-Ski, a tournament style outboard based off the classic hull design of the popular Hydrodyne, can be equipped with motor and a trailer, starting in the low $20,000 range. The size of the motor significantly influences the final cost of a boat, but even a fully optioned 20’ open bow Dyna-Ski will stay priced around $40,000. This is a smart investment for the budget conscious water skier. Outboard motors typically use less fuel than the V-8 engines in most inboard boats. When you consider the power it takes to pull a water skier all morning, this can add up to substantial savings beyond the boat’s already lower sticker price - an advantage that gives you more ski-time for the same amount of money. With outboard motors now just as clean and quiet as any inboard, easy maintenance is another advantage. The diagnostics and repair of a motor that hangs off your transom is much easier than a motor buried in the hull of your boat. Plus, as outboard technology continues to develop, you can modernize your boat by simply replacing the motor rather than the whole boat. But what about performance, how does it compare to an inboard? And Nelson would know. His team owns five outboard boats - four Dyna-Skis and one older Hydrodyne. In September of 2006, a Dyna-Ski rigged with three 225hp E-Tecs, had enough umph to pull 48 skiers stacked four-tiers high - a feat that put the Must Skis and three other Wisconsin Teams in the World Record book. Even if you’re not attempting to break world records, Dyna-Ski is a good option for the recreational user as well. The boat will accommodate friends and family who want to tube, wakeboard, trick ski, slalom or barefoot. And options such as pylons, booms, towers, and fat sacs can be added to suit the serious skier. In fact, Dyna-Ski is currently working with mechanical engineers to designs a device that will further improve the wake for wakeboarders and barefooters. In this economy, value is a principal concern, but a smaller budget doesn’t mean you have to compromise on quality. If you’re pinching your pennies, but still want a high performing tournament style ski boat, take a second look at outboards, especially Dyna-Ski. See how newer motor technology on the back of a classic hull design can benefit your wallet and your skiing experience.